We’re in the week after Christmas. It is cold and I am the only one on the road from Poreč to Vrsar. Along the coast empty hotels are following one after another. On a crossroad near tourist resort Zelena Laguna I turn left on a local curvy road – finally artificial made-for-tourists landscape is behind me. I enjoy driving by woods and fields and very soon I arrive in Fuškulin, a village settled on a small hill with a nice view on many vineyards and the Adriatic Sea on the horizon. 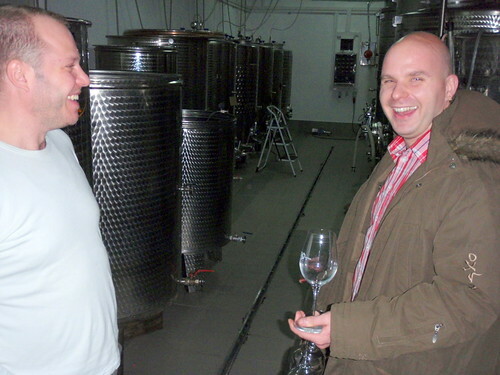 I came here to meet Ivan Damjanić, a 31-year-old winemaker, whose wines are more famous in Croatian capital Zagreb than in Istria. He proudly tells me that he owns most of the vineyards I can see from his house. On 3,8 hectares he has 19400 vines and three whites and three reds (!) grape varieties of which predominate two autochthonous ones – Istarska Malvazija (38%) and Borgonja/Gamay (28%). In the vineyard he uses pesticides and mineral fertilizers in modest quantities only when they are really needed. He follows more his feeling and experience than the advices of agricultural engineers who, according to his belief, are often biased by the propaganda of agrochemical industry. The density of plantation is more than 5000 vines/hectare (which is quite high for Istrian standards) whereas he keeps the yield per vine between 1,5 and 2 kg. According to these numbers and to the enthusiasm in his eyes I am sure Ivan has first class grapes so I am becoming inpatient to try his wines. It is getting dark and cold so we enter in the cellar with stainless steel vats. In fermentation of Istrian Malvasia and Chardonnay selected yeasts are used and temperature is controlled between 14 – 16 °C in order to preserve the primary (varietal) aromas of the grapes. In the last 20 years this method became so popular among Istrian winemakers that today represents the mainstream in white wine production. First we taste young Malvasia from 2009 directly from the vats. It is turbid since it is still lying down on his lees (sur lie method) in three different vats – in the first one it is rustic, fresh and intense, in the second it is round and soft since the malolactic fermentation was finished here, while in the third one the reduction is taking place which adds complexity, structure and fatness. At the end Ivan blends these three Malvasias to obtain the wine with his personal touch. Since when your family is making wine? The story starts in the beginning of last century when my great grandfather Jure had over 25 hectares of vineyards and produced 140.000 l of wine each year. His wines were so appreciated that in 1928 his distributor from Trieste sent few bottles to the competition of International Wine Exhibition of Paris. Everybody had forgotten about this episode, but then one day phone rang: “Congratulations, you got the gold medal for your red wine!”. At first everyone in the family was excited, until they realized that postage to send the prize from Paris is terribly expensive – 40 liras. The only solution to collect the money was to sell a cow. A big family quarrel began because only Jure wanted this prize. But he was stubborn and he sold the cow. I am glad he did it for one reason. In 1945, when Istria became part of socialist Yugoslavia, a great part of Jure’s vineyards were nationalized and serious winemaking in our family died out. If the gold medal from Paris were not hanging in our house, following me throughout my childhood, I certainly wouldn’t follow to my great grandfathers footsteps. Not at all. A big satisfaction was to see the face of my grandfather Aldo when he saw that I sold my sports motorcycle to buy a vineyard tractor. That was back in 1999, the year when winemaking in our family was reborn. We move to the cellar with barriques and tonneaus where five different wines are aged – Malvasia in acacia, while Borgonja, Merlot, Teran and Clemente (a blend of Teran and Merlot) remain 12 – 14 months in oak. I got curious about Borgonja, a red variety that is not so common in Istria and surroundings. Is Borgonja in fact another name for Gamay – a typical variety from Beaujolais? Partly true, it is a clone of Gamay. 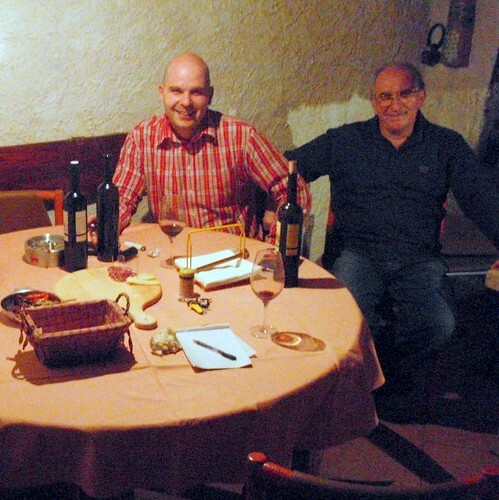 Latest research state that DNA of Istrian Borgonja differs in two chromosomes from Gamay. 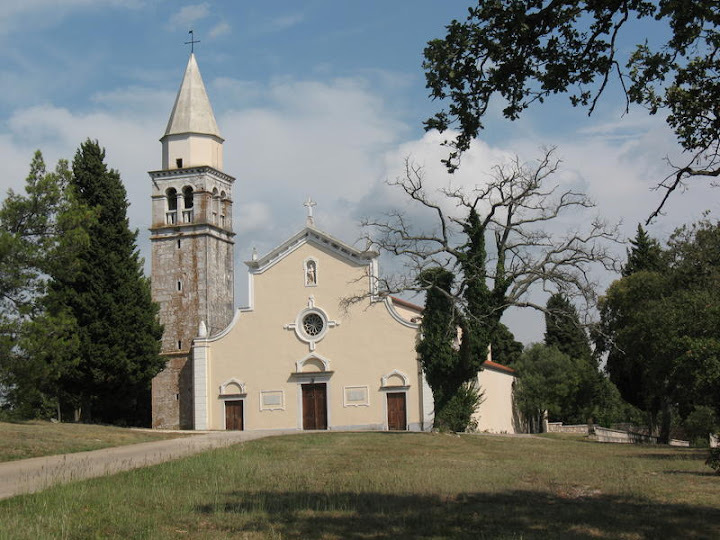 It is believed that Roman emperor Probus brought Borgonja in Istria in the 3rd century. Borgonja is so adapted to Istrian terroir that it can be regarded as autochtonous variety. How old are your vines of Borgonja? A part of them are about 100 years old – my great grandfather has planted them just before First World War. They give only 0,6 kg per vine but their grapes are of amazing quality. To renew the vineyard I started to make new vine seedlings out of this old Istrian Borgonja vines but I also bought original French Gamay. I am curious to see which clone will give better results. Your Borgonja is very fruity and with pronounced minerality that makes it a food-friendly wine. It is not pretentious because it does not want fight with the food, it is just caressing your palate. You’re right, it is a very easy drinking wine, enjoyable in all seasons, and it is hard to find a wine in Istria with such great food versatility. It goes with cheese, fish, meat, pasta, pršut (cured ham), sausages… I adore it in the summer, slightly chilled, with char grilled sardines. A perfect pairing! Apart Borgonja, there are also Teran, Merlot, Merlot Barrique and Clemente. The first three are monovarietal wines while the last one is a blend of Teran and Merlot grapes. Merlot Barrique and Clemente are serious wines dedicated to real wine enthusiasts, those who enjoy discovering fine nuances in aroma and flavor. A message at the end? A big thanks to my family who gave me a lot of support in this crazy wine adventure. Even if I invest a lot of passion and effort in this business, without them these wines would not be here now. I am leaving Fuškulin pleased that I met another young Istrian winemaker who believes that good wine is made in the vineyard. 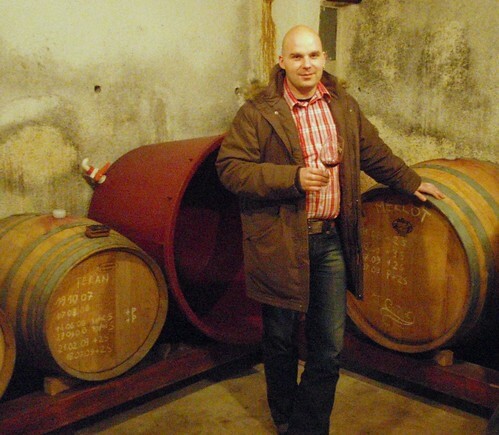 Damjanić created not only another modern Istrian Malvasia with a personal touch. He has also courageously demonstrated that, with good work in the vineyard, Borgonja can compete with much-loved and popular autochthonous varieties – Malvazija and Teran. With some good marketing, this joyful and unpretentious wine that seduces upon the first sip could become, after Istrian Malvasia, the next hit wine from Istria.